A shallow westerly wave continued to affect upper and central parts of the country as the weather system intensified on Sunday. It is likely to grip most of the country on Monday, noted the Pakistan Meteorological Department (PMD). It was said that the new weather system would bring substantial rain to Makran and Kalat divisions as well as scattered places in the divisions of Quetta, Zhob, Sibbi, Nasirabad, D G Khan, D I Khan in Balochistan. In Khyber Pakhtunkhwa, Bannu, Malakand, and Kohat districts would also receive rainfall. Meanwhile, few moderate to isolated heavy showers are also likely in Makran, Zhob and Quetta divisions whereas a hailstorm is expected at a few places during the period. The weather department noted hot and dry weather was expected elsewhere in the country. It was asserted that during the past 24 hours, rain with thunderstorms and gusty winds had occurred at scattered places in Khyber Pakhtunkhwa, Kashmir, Punjab, Islamabad, Gilgit-Baltistan, Quetta, Kalat, Sibbi and Zhob divisions. Hot and dry weather was experienced elsewhere in the country. In a dismal development, over 20 people lost their lives to flash floods caused by heavy downpour in South Waziristan and Balochistan, on Saturday. 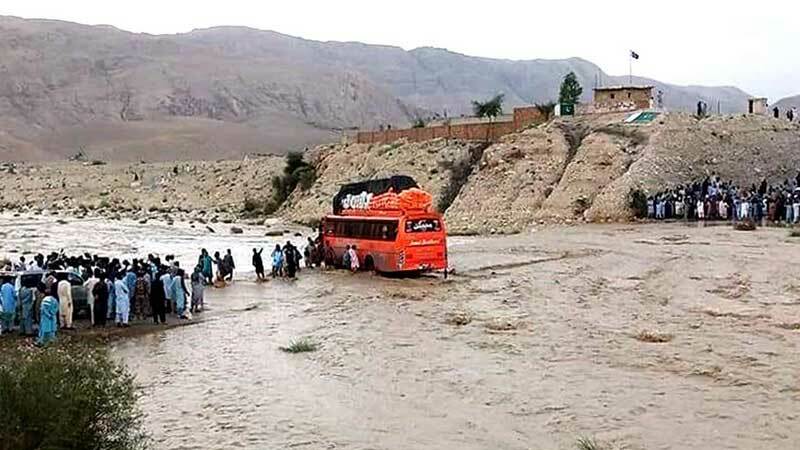 As many as 14 people, including eight children, were killed when a flash flood swept away a passenger bus near Toi Khullah, South Waziristan. Passengers were on their way from Wana to Zarmilan to attend a wedding when they met the fateful accident. Meanwhile, another minor was killed when a makeshift house was swept into raging currents near Wana. In Balochistan, four members of a family were killed in a flash flood in the Khanozai area of Pishin district. Another man was killed by heavy rain in the Pir area of Bolan district. Another fateful accident saw nine picnickers being washed away by strong currents. One drowned while the rest were rescued. The deceased was identified as Muhammad Naeem. Flash floods trapped over 150 Hindu pilgrims in the Kachhi area of Bolan district.